Never to be seen again price! 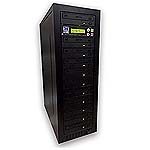 The M-Tech 1 to 10 DVD duplicator is one of the most advanced, yet simple to operate DVD Duplicators of it's kind. Copies are made direct from a master DVD on-the-fly to your DVDR media, giving perfect copies every time. Using automatic disc format recognition software, no programming is required. Ideal for Music and Data.